A wild rumpus of a literary thriller—the kind that doesn't come along very often, by the young Booker-nominated Beauman. In 1938 an ancient temple is discovered in Honduras, and two expeditions set out: a film crew and actors intend to film a comedy there (based on an actual plan of Orson Welles to shoot Heart of Darkness, which didn't happen). The other group plans to deconstruct the temple and ship it to NYC. But the temple is at the center of other dark conspiracies as well. Both groups become mired in the jungle for twenty years until a CIA operative arrives with his own ideas about the temple. It's Gilligan's Island, Lost Planet of Z, and Ian Fleming in a dazzling mash-up of dense and brilliant writing. A terrific long winter's read. In 1938, two rival expeditions descend on an ancient temple recently discovered in the jungles of Honduras, one intending to shoot a huge Hollywood production on location there, the other to disassemble the temple and ship it back to New York. A seemingly endless stalemate ensues. Twenty years later, a rogue CIA agent sets out to exploit the temple for his own ends, unaware that it is a locus of conspiracies far grander than anyone could ever have guessed. 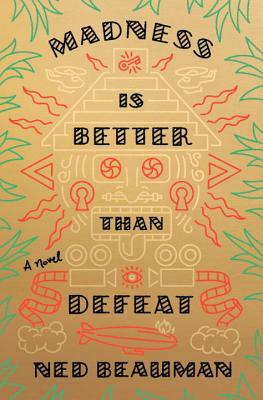 Shot through with intrigue, ingenuity, and adventure, and showcasing Beauman’s riotous humor, spectacular imagination, and riveting prose, Madness Is Better Than Defeat is a novel without parallel: inventive, anarchic, and delightfully insane. NED BEAUMAN was born in 1985 and studied philosophy at the University of Cambridge. He was included on Granta's 2013 list of the twenty best young British novelists, and his work has been translated into more than ten languages. He lives in London.